To people who work in and around the financial industry it is self-evident that capital markets play a vital role in channeling investment into the economy to help drive growth and prosperity. But to most people outside of the industry, what capital markets do and the value of what they provide is less obvious, particularly given the shadow of the financial crisis. This report aims to address that disconnect. Capital markets are a strategic asset to the UK and European economy. In the UK, more than £4 trillion of capital is invested in capital markets through the pension funds, insurance policies and individual savings of more than 30 million people. Last year, companies in the UK raised more than £100bn in capital in the bond and equity markets and through venture capital (equivalent to 6% of GDP).The value of the UK corporate bond market and stockmarket is more than four times larger than the value of bank lending to UK companies. And depending on the sector, between 30% and 80% of all capital markets activity in the EU is conducted in the UK. In light of Brexit, the value of capital markets to both the UK and the rest of the EU is more important than ever. But what capital markets do and the value of what they provide is often complex, distant and confusing to people outside of the industry, and in the wake of the financial crisis the industry faces many challenges in rebuilding trust, reconnecting with individuals and aligning itself more clearly with its customers. ♦ To identify the value that capital markets deliver to the UK and EU economy, to society, and to individuals (in terms other than employment in the sector, tax receipts and contribution to GDP). ♦ To demystify what capital markets do, outline how different sectors of the financial markets operate, what value they deliver, and how they all fit together. ♦ And to outline how capital markets have responded to criticism since the financial crisis, review the main challenges that the industry still needs to address, and suggest how it could do a better job. We think this is the first attempt to explain how the different sectors of the industry fit together and how they operate in an accessible way (the report covers 10 different sectors of the capital markets and is only 24 pages long). And we think there is a big opportunity for the industry to get on the front foot and make a clearer and more constructive case for the value and purpose of what it does, and where necessary to change how it operates to meet that purpose. We hope this report encourages policymakers, customers, and people who work in the industry to think about capital markets in a different way. for its customers – and how it could do it better – every day. The capital markets industry is good at talking about big numbers, but not so good at talking about smaller numbers. At the heart of the capital markets are individuals – you and me – who provide the bulk of capital that is put to work through contributions to pension funds and insurance policies, and who are the ultimate beneficiaries of the capital markets. It should be a sobering thought for anyone in the industry that the average pension pot in the UK is just over £43,000, which would produce a retirement income of around £2,000 a year. By coincidence, that is roughly the same as the average weekly after-tax income of employees in investment banking and asset management, according to our own research. We believe that only by refocusing on its underlying purpose and on the interests of the society it exists to serve, and by rethinking its business model and the way it operates accordingly, can the capital markets industry avoid painful reforms being imposed upon it. 1. Capital markets play a vital role in connecting the providers of capital with users of capital. They channel savings into productive investment and help companies, investors and individuals manage their risk. Capital markets provide a supplementary source of funding to bank lending, and act as a ‘spare tyre’ for the economy. 2. Capital markets are a strategic asset for the UK economy, providing an important source of funding. The combined value of corporate bonds and listed companies in the UK is more than four times the value of bank lending, and the amount of capital raised in the corporate bond and equity markets by UK companies each year is equivalent to nearly 6% of GDP. 3. UK capital markets play a significant role in the European economy. Capital markets in the UK are twice as developed relative to GDP as in the rest of Europe, and between 30% and 80% of all capital markets activity in the EU is conducted in the UK. 4. Effective capital markets start with deep pools of long-term capital. In the UK, pension funds and insurance firms have £3.4 trillion to invest in markets, and individuals have another £1 trillion that can be put to invested more productively than putting it in the bank. Annual contributions to pension funds add up to more than £60bn each year that can be put to work in the economy. 5. While capital markets are primarily for institutions, individuals provide the vast majority of capital that is put to work in the capital markets through contributions to their pension funds, insurance policies and direct investments. We are all the end users and ultimate beneficiaries of capital markets activity. 6. 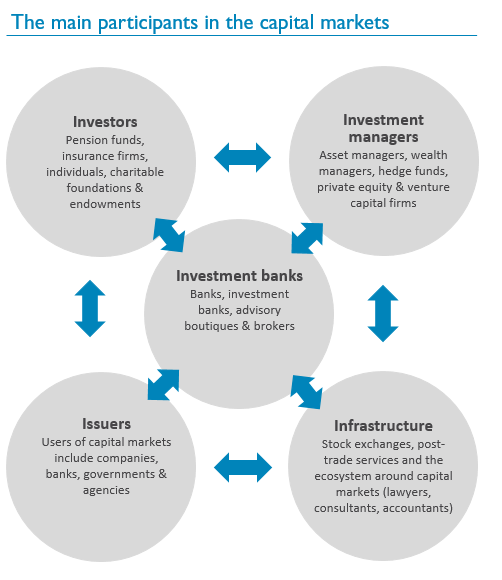 Investment banks play a central role in capital markets, advising companies and investors, enabling companies and governments to raise capital, connecting buyers and sellers in the secondary market, and helping companies and investors manage their risk. 7. Asset managers play an important role in managing money on behalf of clients, allocating capital, making investment decisions, and providing oversight and governance of the companies in which they invest. 8. Since the financial crisis, the capital markets industry has faced significant challenges in rebuilding trust with policymakers, customers and wider society, as well as changing its culture and addressing misconduct. While much progress has already been made, managing this important process could define the industry for decades to come. 9. The capital markets industry also faces significant structural challenges such as adapting to a wave of regulatory reform, dealing with the implications of Brexit, responding to the rise of fintech, restructuring its business model, and addressing the dominance of overseas market participants. 10. The capital markets industry is complex, but does not have to be so complicated. Given the important role that it plays in society, different sectors of the industry should work together to rethink how to articulate and communicate a more constructive case for the value of what they do that focuses on the benefits for customers and society. This report aims to make a contribution to that process. New Financial is a capital markets think tank launched in 2014 that believes Europe needs bigger and better capital markets. We think this presents a huge opportunity for the industry and its customers to embrace change and rethink how capital markets work. New Financial runs a managed programme of research and private events for senior executives and policymakers on themes such as making the case for capital markets, the impact of Brexit, rebuilding trust in the industry, and driving diversity. New Financial is a social enterprise funded by nearly 20 institutional members from organisations across the industry that share our commitment to bigger and better capital markets. For more information on our work, click here.